July 22, 2018 Filed in Photography, Street Photography, This is My Oakland! 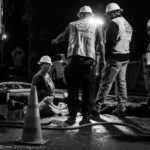 Oakland CA – There was a late night water main burst at Oakland and Monte Vista Avenues in Oakland. I saw this on my way home and stopped to snap a few photos.